Cluster beans is called as kothavarangai in Tamil. It is diabetic friendly vegetable and is rich source of protien as well as fiber. This poriyal is very tasty and goes well with rice. 1) Clean and cut the cluster beans into small pieces. Pressure cook it with adding turmeric powder and keep aside. 2) Heat a kadai and add 1 tbsp oil and mustard seeds. 3) After it crackles, add urad dal and saute till light brown in color. 4) Now add the cluster beans and saute for 10 mins. 5) Then add the rest of oil, mix well and keep it in low flame to get a nice fry. 6) Now add salt, sugar, veggie powder and mix well. 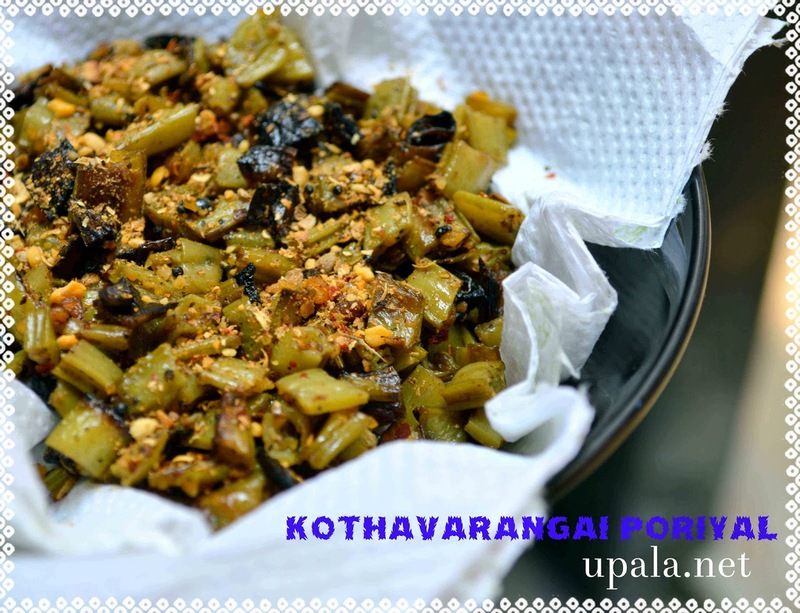 1) You can prepare this poriyal by adding 2 tbsp fresh Grated coconut finally. 2) While tempering, you can add channa dal (split chick peas) too. 3) If cluster beans are not tender, before cooking then saute them for a min in a kadai with 1 tsp of oil. Then pressure cook them mixing with turmeric powder to cook soon. 4) If you don't have this veggie powder, you add 1/2 tsp of coriander* powder and 1/2 tsp of idly milagai podi. It tastes similar but this veggie powder makes it more tasty.